Get The Cubix 3 At Lazada Birthday Sale And Get A Chance To Win A Trip For 2 To Dubai! 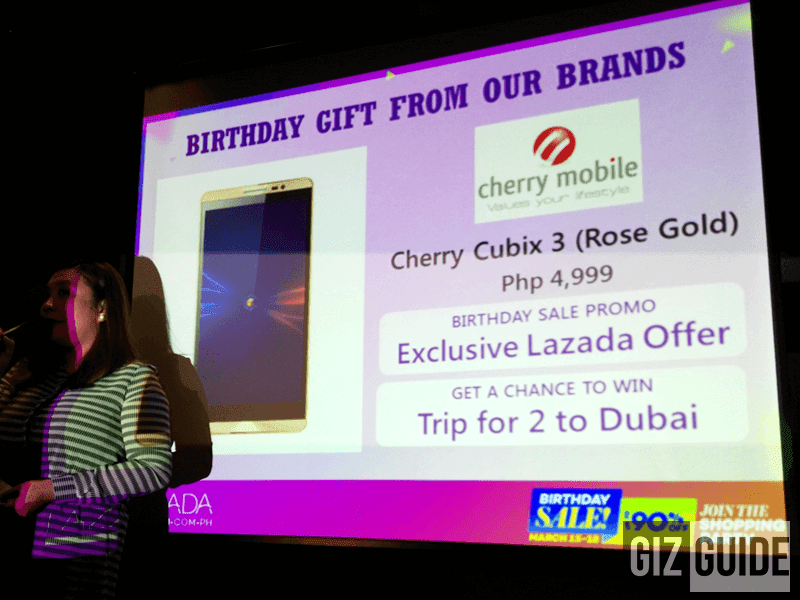 Home / cherry mobile / mobile / news / Get The Cubix 3 At Lazada Birthday Sale And Get A Chance To Win A Trip For 2 To Dubai! Earlier, at the Lazada Birthday sale, Cherry Mobile just announced several interesting announcement regarding their upcoming Cubix 3. First the said device will also come with the popular "Rose Gold" color variant and buyers at the sale this March 15 - 18, 2016 will get a chance to win a trip for two to Dubai. In case you missed it, the Cherry Mobile Cubix 3 is one of the most affordable device in the country to boast such specs under 5K Pesos. It rocks a 5.5 inch HD IPS screen, 64 Bit octa core chip clocked at 1.3 GHz, 2 GB RAM, 16 GB expandable ROM and 2,700 mAh of battery. It also has an upgraded 16 MP rear camera at the back, 5 MP selfie camera and now runs with Android 5.1 Lollipop OS in near stock form. Related: First Look! Cherry Mobile Cubix 3 Impressions! The Next Great Sub 5K Phone? Click Here!